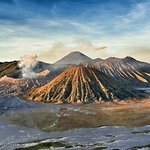 our Network - our Service around Indonesia! Start your Journey, use our Rental Network between Yogyakarta and Maumere! 5 Island connected thousands of Kilometers Adventure! All our bikes equipped with mobile holder & USB charger, luggage rack & strap, 1 or 2 helmet. The minimum riding between the destinations will 5 days. If you like to see more spots like 17th islands, please plan some extra days! 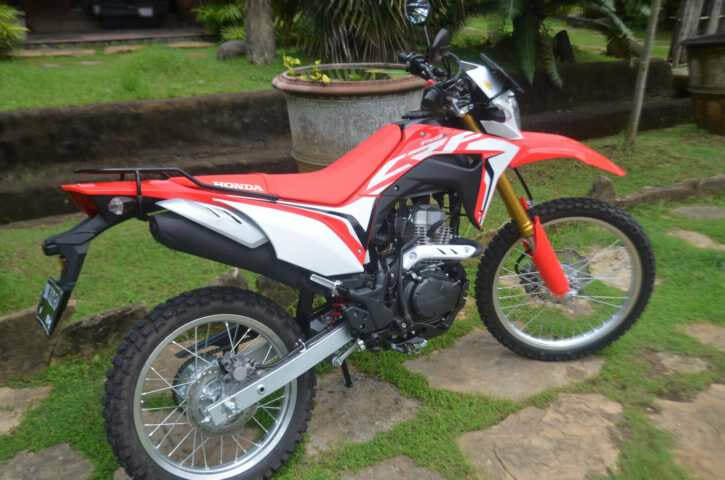 In Labuan Bajo and Maumere we do not deliver the Bikes. please pick it up and return at our Rental stations. Costumers who are in Bali before can visit our office. We provide many helpful travel information´s and hidden corners. please order your Motorcycles in advance. Our prices in Flores are slightly higher than the rest of Indonesia. This is due to higher wear. The roads and passes in Flores are steep and minor roads often in bad condidions. The wear requires a higher service effort. The replacement and service parts are much more expensive than Bali or Java. There are also service fees. For this we offer a safe well-maintained bike which is equipped for touring. Further we offer you the one-way rent, which saves a lot of time and costs, instead of a return to the starting point. 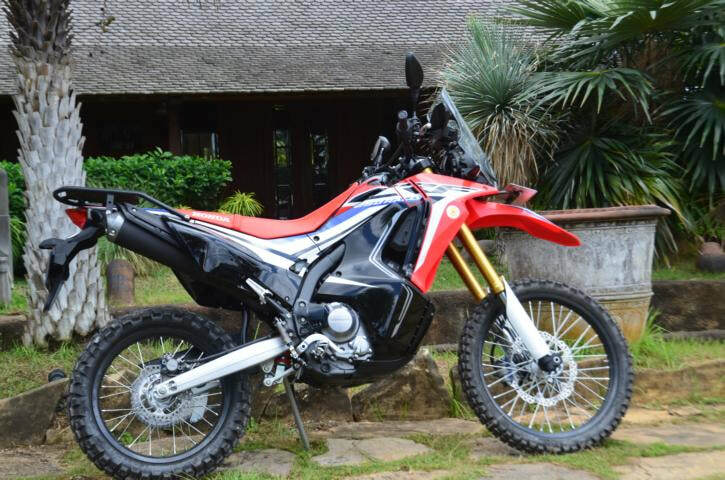 From your starting point in Maumere or Labuan Bajo you can extend your rental and return the bike in Bali or Yogyakarta. We will calculate an individual offer according to your wishes. 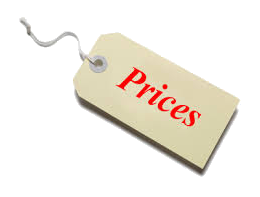 Prices include handling, service fees and tax. Can't recommend these guys highly enough. 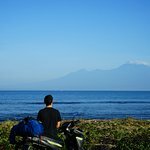 I rode from Bali - Lombok - Sumbawa - Flores over 2 weeks. Chris and the team were so helpful, pulling out maps, showing me the best routes, good accommodation, highlighting points of interest I would never have known/found on Google. I wasn't sure how long it would take (or how long I could endure) but they made it really easy - I just let them know along the way if I wanted to use the one way service, where I could drop the bike in Labuan Bajo and fly back (they also have this for Lombok and Java I think). I ended up taking that, and it was really easy, and a very reasonable price considering someones has to fly there and drive it all the way back. They always reply on WhatsApp really quickly, not that I needed much support - the bike was solid. The trip was amazing, Flores especially, wonderful scenery and people. Really was the highlight of my time in Indonesia, and I can't wait to come back and drive east! (Sorry for the slow review guys). All Motorbikes comes with mobile holder & USB charger, luggage rack & backpack extension, Baggage strap. on request: Rain Poncho, First Aid Kit. optional see our equipment with many options for touring. SPECIAL OFFER !!!! - SPECIAL OFFER !!!! - SPECIAL OFFER !!!! returns of Motorcycles between our bases. Price per Bike: US$10 per day total: US$60 Save US$70 !! Price: US$15,50 per day total: US$108 Save US$241 !! Price: US$19,00 per day total: Save US$340 !! Price: US$41 per day total: US$287 Save US$122 !! Price: US$35 per day total: Save US$230 !! Price: US$19 per day total: Save US$340 !! How do our customer thinking about this one-way rental?? 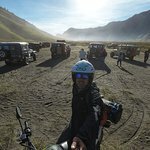 From Bali to Flores by scooter with 2 children ( 6 and 8). We made a wonderfull trip with our two children ( 6 and 8 years old) from Bali to Flores. We rented our scooters from Chris in Bali. We were so happy that he was renting his scooters for only one way. 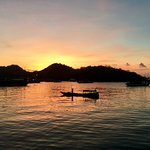 We took the ferry from Bali to Lombok and drove slowely over Lombok. We visited the Gili islands, and the North parth of Lombok. This area is really beautifull. The nice thing with the scooter is that you can take the small roads, and than you have really nice contact with the people. Everybody is waving at you. We took the ferry from Lombok to Sumbawa. This island is less develloped than Lombok. Houses are built on different styles. Sumbawa is totaly not toeristic. From Sumbawa we took the ferry to Flores. this takes 8 houres, but you have beautifull views on the islands of Komodo and Rinca. We spent most of our time in Flores. Flores is really really Beautifull. Flores has beautifull and nice traditional villages. We slept in several villages. The people are very welkom and hospitabel. It is really a very nice experience to see how the people live there lives, how the children go to school, how they have there wake-up habbits in the middle of the village at the waterwell. The nature is very very beautifull, the beaches are wonderfull. We loved Flores. 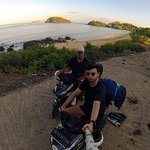 Our journey with the scooters took us 23 days and we drove very relaxed 1700 km From Bali to Maumere in Flores. It was an amazing trip!! I can really recomment This company. The bikes are very good. We even had no flat tires. Chris is a wonderfull guy. He takes a lot of time for explaning the area were you want to drive. He knows the area very well. We wanted to drop the bikes in Maumere, but Chris had a drop adres in Labuan Bajo. But he did his best and we could drop the bikes in Maumere. We were so happy that we could see whole Flores by scooter!! He is very enthousiast running his company. We arranged a one-way rental with starting point in Yogyakarta and ending point at Lombok Airport. 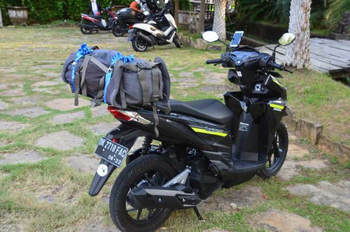 We chose the KawasakiWe arranged a one-way rental with starting point in Yogyakarta and ending point at Lombok Airport. 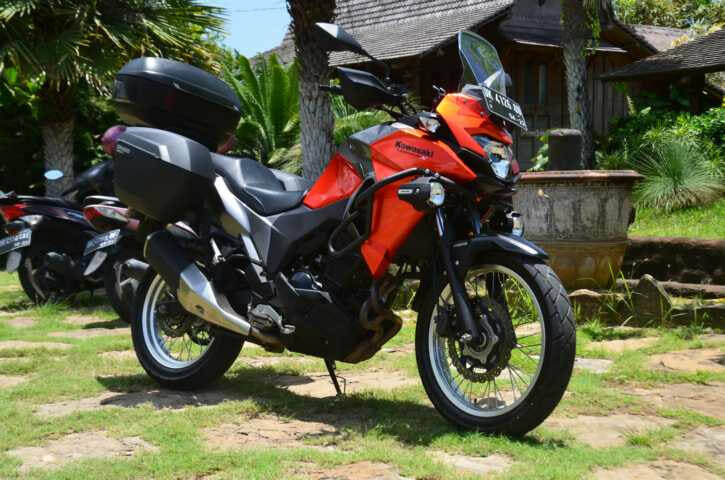 We chose the Kawasaki Pulsar 200cc for our journey and it had just enough power for the two of us and 14kg of luggage (two smaller backpacks). In total we drove 1450km and 15 days from west to east and had a amazing adventure. No problems at all with the bike and everything worked like a charm. Many thanks to Motor Adventure Bali for good customer care and fast respons. 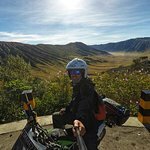 Fantastic experience!My girlfriend and I rode a Honda CB150 from Bali to Yogyakarta through Motor Adventure's 6-day one-way rental. 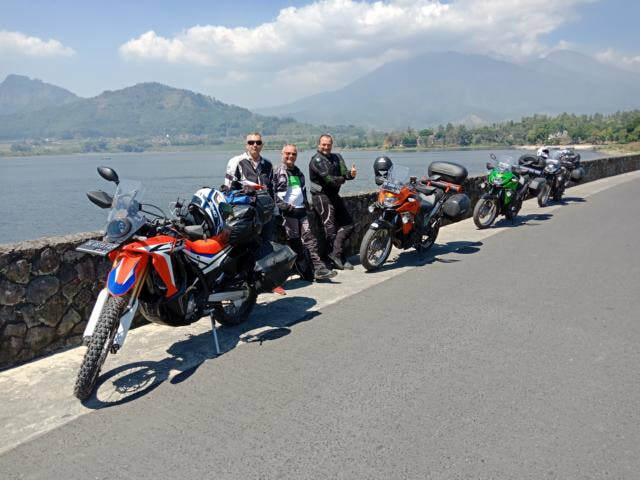 Chris and the team's advice was very helpful, the motorcycle was flawless and the flexibility and freedom the bike gave us made it an ideal method of travel in Indonesia. 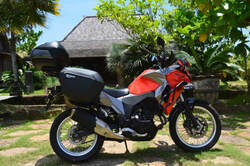 Tour from Flores (Labuan Bajo) to BaliWe have had the "big Bikes" from the agent. Our Tour Guiding and Organisation was perfect and extremly friendly. Bikes were good maintainaced and in good Condition. 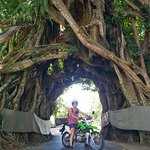 The Ride was a great Adventure and we will defenitly do it again...and again....and again... :-) Ask also for One-Way-Rental to the Islands around Bali ! 2 up on a 250 Touring bike for 22 daysMy wife and I searched other islands for a bike large enough for us and our 2 large backpacks. We finally found Chris and Motor Adventure Bali on line that had that the exact big bike we needed. The real bonus was the ability to rent it one-way from Bali to Flores. The rates were fair and the service was great. 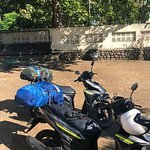 We traveled 3-5 hours a day most days and spent 4 Bays on Bali in the north, cut across Lombok in 1 (we had already visited previously), 7 on Sumbawa and our last 8 on Flores. We could have spent double that time on Flores. It is so beautiful. Most roads throughout our trip were good. On the north of Flores they were fair to poor and challenging but this seems to just be the norm when you are off the main East West road. The sights we saw while on the bike and the freedom and places we could go because of the bike were something other travelers just wouldn’t be able to do on a car or bus tour. The Kawasaki Versys 250 Touring with the bags, USB charger and all was new and in top shape. I can’t recommend this shop any better. They really go out of their way to do it right with the best equipment. 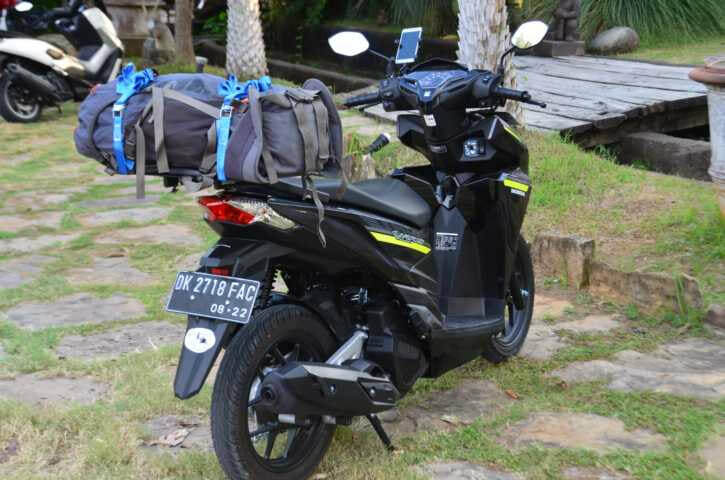 2 125cc scooters rent from Lombok to FloresWhen my friend and I decided to do a motorbike trip across Indonesia, it was impossible to find a company which proposes to rent scooter from A and get back the scooter on another island. Chris and team have the only company which proposes that. The scooters were ultra clean, his staff was on time to our hotel for giving us the scooters and for taking back. Scooters had GPS holder and battery charge, helmets really clean. Everything is really pro', I definitely contact Chris again for my next Indonesian trip. Highly recommended! Epic motor bike ride thanks to motor adventure baliI hired a bike from motor adventure bali, and rode solo to yogyakarta, 7 day trip, one of the best things ive ever done! They made it as easy as possible providing me with everything I need, even a wifi dongle which I could not have done without, bike was well maintained and had no issues at all.